I usually say that I never tire of asparagus during the season. I think I may have this year as I’ve been eating it for England. We’ve had it in every guise possible so time to move on me thinks. I’ll miss it when it’s gone though. That spindly stuff from Peru doesn’t quite cut the mustard. I’m scurrying around trying to get ready for Talented Art Fair on 17th because I’m off on a trip to Iceland this weekend. Really looking forward to it and hoping for whales and northern lights. The weather forecast isn’t looking great though so I may just resort to eating a lot of herring. We’ll see. If you can’t get to Talented but fancy going to the Affordable Art Fair in Battersea, today until Sunday, I will have work on the stand of Art Salon (stand C5). You can print off free tickets here using the code ARTSALONPV. There, a little freebie on a rainy day for you. Here’s a sketch of an artichoke that I did prior to the larger painting I showed you on Monday. Here’s another one of the larger paintings , destined for the same coming project, whilst I busy myself with some dailies in my studio this week. I have the doors flung open and Bubba is basking in the spring sunshine………..bliss! The washing up is piled high in the sink but, what the heck. I thought you’d like to know that I shall be having a stand at the Talented Art Fair in the Truman Brewery, Brick Lane, London on March 17th-19th. If you’d like a ticket for the private view on Friday 17th at 6pm, do let me know and I’ll send you one. I’ll have lots of my larger paintings on display as well as prints, cards and notelets. I’ve been pretty busy painting larger works lately for a special reason which is under wraps at the moment. Hopefully, I’ll be able to impart that info in a couple of months but in the meantime, here’s a sneak preview. Hope you like it. Well, I had a great time painting in Norfolk at the weekend but I’m back in the studio now and raring to go on all the delicious fruits that are turning colour. Love a bit of rotting fruit. Here’s a sneaky peak at what I got up to in Norfolk and an artichoke in full deliciousness. 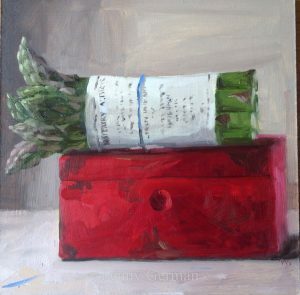 I was wandering down the veg aisle in Waitrose, as is my wont, when this little chap spoke to me from the shelf and asked me to take him home and paint him…….so I did. I speak to vegetables a lot. A constant source of worry.